In a food processor, cream the butter till light and fluffy. Add the sugar, beat again. Add the egg and vanilla and process until smooth. Add all of the dry ingredients and process for quite a while until very smooth. Lightly butter a cake pan. I used quite a small one–eight inches across with 2 inch high sides. You could use a wider, shallower pan, just watch the cooking time. Pour the batter into the pan. Mix the jam and rum in a small cup, and spread this over the cake, leaving a border of about 1/2 inch all around. Sprinkle the chocolate chips over the jam. Bake for about half an hour, till the edges are golden and it’s pulling away from the sides. You can stick a knife in the center, and if it comes out clean, it’s done being cooked. 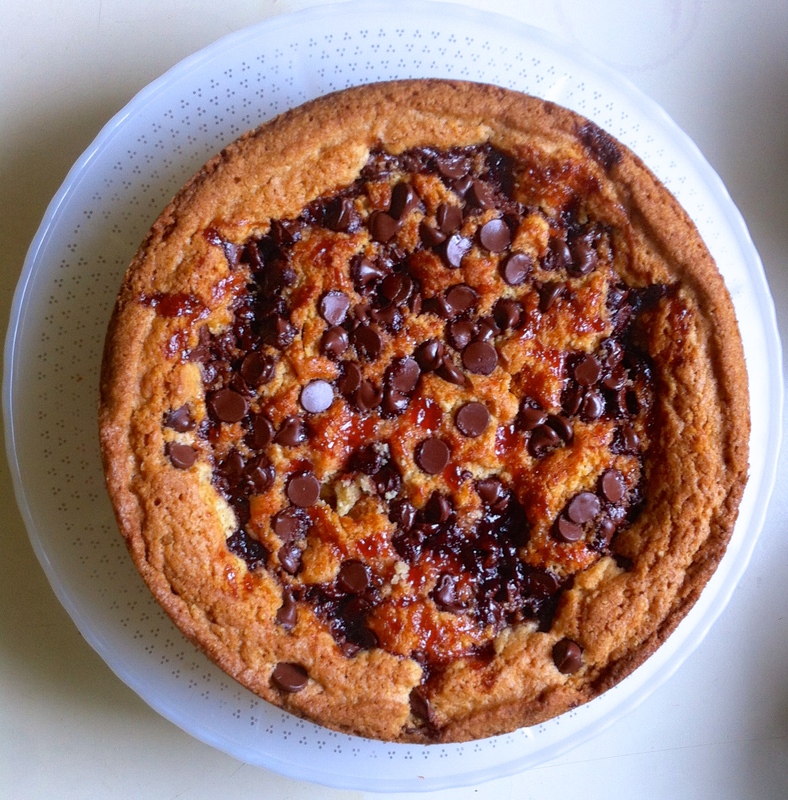 This entry was posted in cake, chocolate, dessert and tagged almond cake, jam cake by Claire. Bookmark the permalink. Wow, that cake looks gorgeous. And I’ve got some jam…Mind you, I made some hot cross buns today and they really didn’t rise well. Or at all, in fact. So perhaps the baking fairy has left me. Perhaps she’s gone on holiday…oh, I know, she’s gone on holiday and while she’s there she meets the book-publishing fairy. And the book-publishing fairy says: How’s yours getting on? And the baking fairy says: Oh, terrible. She wanted to make some hot cross buns but I just couldn’t be bothered. I really need this holiday. How about yours? And the book-publishing fairy says: Well, I see your point, but isn’t it our job to encourage them? Smooth the path, sort of thing?…Hmm. Well, enjoy your holiday. I’m off to do a bit off path-smoothing, See ya! That’s a very likely scenario. I believe it! I like reading your musings. But I’d really like a slice of that cake, please! Assume the nuts turn into flour. Can we leave them a bit gritty for texture without the cake being too wet? Have you published short stories to get known before a novel? Just wondering how to help fate along……good publisher hunting! Thanks Joan! The nuts do turn to flour, but you can certainly leave them a bit gritty. I’ve added other nuts, too–hazelnuts or pecans, which tend to stay grittier than almonds. I like a combination of almonds and something more substantial. I’ve tried sending stories to different literary magazines and publishers, but I’ve had no luck that route either. Ah well.